No one is lucky enough to have a large, spacious room to hold a reception. If you live in an apartment or a house with a small living room, it’s always a mindful job to arrange everything; where to put the sofa, how to get enough traffic space, how can I get the light in, et cetera. To help you out, here are the 12 best small living room decorating ideas that work. Well, I know it doesn’t change the size of a room, but placing a mirror as your wall decoration can create such a spacious feeling. Put the mirror on the center or focal point in the room and near the window, so it can reflect as much light as possible and give the illusion of you seeing the reflection, which makes it appear larger. No bubbles and plumps; instead, choose decorative things that are linear. For example, put a geometric-styled ottoman in monochrome color or upholstery with linear print for your chair. This way, the linear prints can create an illusion of length and width while improving the structure for small living room decorating ideas. Don’t get too stubborn by choosing your favorite antique clock bell to display in your small living room; you don’t have enough space for that. Choosing furniture need visual weight consideration. If space doesn’t allow, choose a loveseat instead of a couch; armless chairs or a small coffee table can do the trick. If a room has a small space, try to make it appear larger by using horizontal linings wallpaper. Moreover, the horizontal wallpaper can have the effect of elongated and stretching illusion for small living room decorating ideas. It doesn’t have to come in monochromatic color; instead, you can play with different colors to add sophistication. Attaching floor to ceiling drapes also makes a stylish way to achieve small living room decorating ideas on a budget that it will draw the eyes upward. Use long curtain to cover the windows that can instantly improve height in a room space. Hang it right where your wall interacts with the ceiling, and let the rest slightly muddled on the floor. While you don’t want to cramp the whole room using furniture, the best way in small living room decorating ideas is using small to midsize artwork. It should be hanging so it won’t take that much space. A striking painting or photo illustration can create a distraction and draw the visual beyond the eye-level space and make a room feel greater than its actual size. This is the expert’s eye on small living room decorating ideas; small patterns only make a room smaller. Play with your creativity and choose a bold, daring pattern to decorate the space. Go beyond a wall coverage and cover the ceiling as well to expand the maximum look of the space; a small room allows you to go loose with any pattern because they’re still contained. It’s one for all but not all for one. When you think of certain furniture, think one that can serve multiple purposes. For example, an ottoman table with hidden storage beneath is more useful; a foldable chair can also help improve the traffic area without compromising quality. To create layering lights, you need to stack up everything at multiple levels. For example, attach a big or floor to ceiling windows with multiple panels, and keeping lights at multiple layers using chandeliers, task lights, and floor lamps. This way, you’ll get the impact of the well-lit room and a warm atmosphere. If you’re thinking of maximizing the room space, consider legs-free furniture for small living decorating ideas on a budget. Choose pieces that can be directly attached to the wall, floating stuff like shelves and storage can function beautifully and clear up the floor space for you to operate or adding other pieces that need to be on the ground. The good thing about going for monochromatic is simplicity. You can’t make the small living room appears to overcrowd by putting too many different colors; monochromatic creates a nice clean finish look instead. If you don’t fancy the black and white thing, go for neutral colors like brown. They’re great enough to provide additional illumination by reflecting the light. Redesigning your front door is indeed a good idea if you want to give a new look for your house. 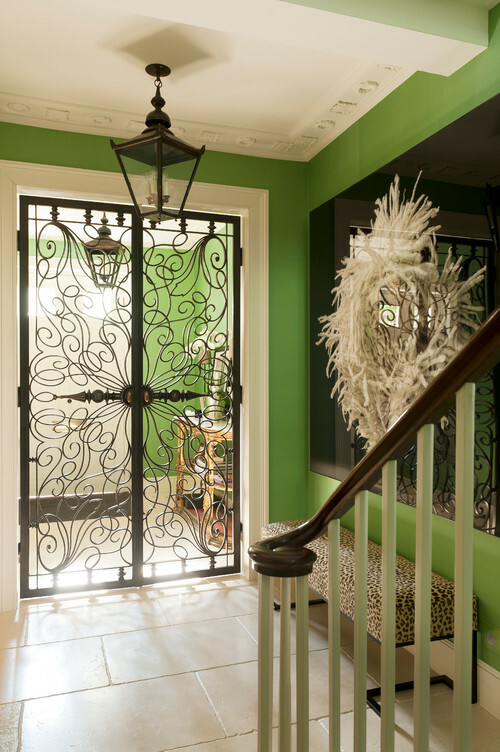 There are many types of entrance door designs, and types that you can use, and one of them is the wrought iron doors. 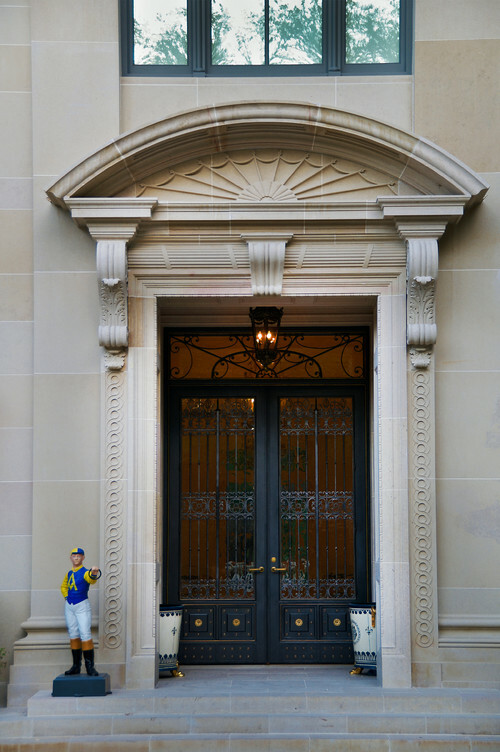 A front door design would create the appeal of the house’s façade and entrance. This is why many people invest in expensive doors as well as to get a higher level of security. 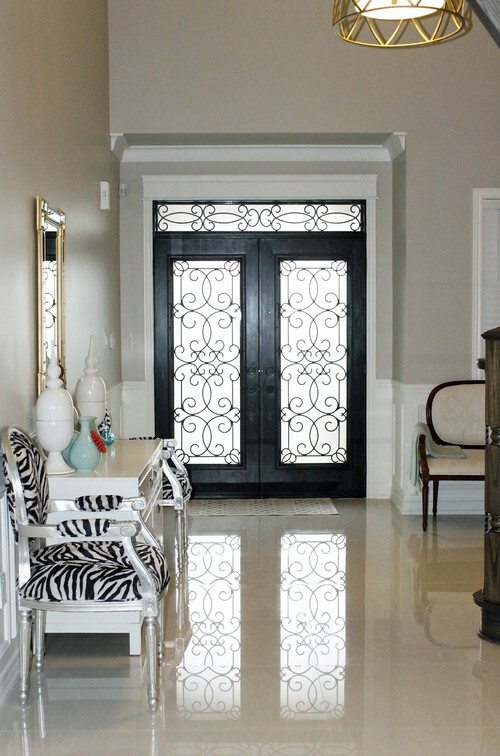 A wrought iron door would give you both the appearance and the sturdiness. Wood and glass would be the best pairs for wrought iron. Whether you are choosing light or dark tone on the colors, you may find one of these front iron doors designs below match with the whole concept of your house. House experts agreed that wrought iron has a long history of craftsmanship. The value of the item is on the complexity of the work. Taken back to the early time when the technique was found, a classical, medieval time would give an authentic look for your house. The style involves curvy lines with arrows, crosses, and swirls. The fact that the medieval version of the wrought iron was usually installed in its raw color, you can modify to make it look brighter by applying other colors like white and gold for the finishes. Not sure if arrows and swirls fit your style? Choosing a contemporary style for your wrought iron doors and windows might be the right choice. 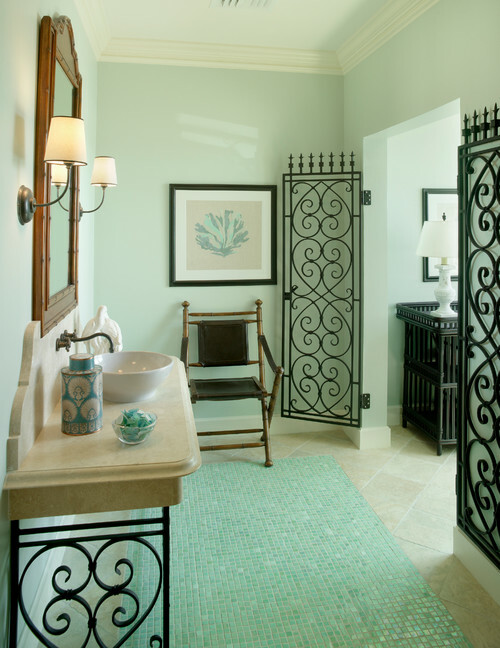 The modern style of wrought iron has cleaner and bolder lines with less intricate details. The style consists of sleek and straight edges and sometimes is combined with other material such as glass and wood. This contemporary wrought iron mold is the most flexible style regarding its pattern and color. The term shabby chic was first used and popularized by The World of Interior magazine in the 1980s. It features a feminine style of designs and pattern. Besides linen and flowery fabrics, the design also uses wrought iron. You can use the shabby chic pattern on the wrought iron doors especially if you want to apply a softer type of mold. It is usually painted in white with details like swirls, flowers, and cage-like shapes. If you’re into eclectic style, why not ask the craftsmen to make something that is inspired by the pop culture. Certain symbols from your favorite movies can be a great idea. Or, you would want to make your house looks like a Hobbit house with curved edges and swirling wrought iron on the surface of the door. 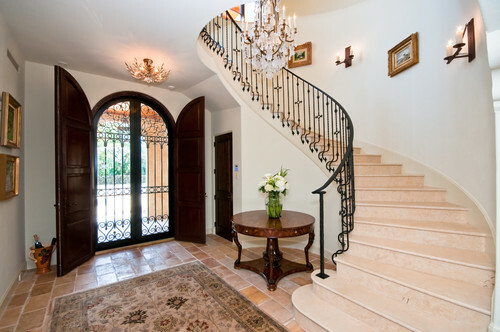 The best thing about wrought iron doors is that the design is absolutely yours to decide. Requesting your family’s initial or the house’s number would make the door more personalized. Though popular for its durability, wrought iron doors still need to be maintained especially after a long humid or wet season. The long duration of exposure to water may create rust and deteriorate the material. To make it last longer, you can apply one of these tips. 1. Clean the Iron Doors and Windows Using Vegetable-based Soap. That alkaline on the soap works gently on iron so that it would not make any stain. After wiping the whole door with a mixture of soap and water, rinse it off with water and wipe dry. 2. Repaint the Door Every Once in a While. Rainwater tends to be acidic—that is why it creates rust and flakes on the iron. To maintain the door, you might want to scrub the rust off and apply a newer layer of paint. The wrought iron may last longer than the other materials. If you use a combination of wrought iron with materials like wood or glass, make sure that you also pay attention to it. For example, wood needs to be refinished with varnish so that it can endure the weather. For glass material, wiping it daily with the right cleaner would keep it from molds. 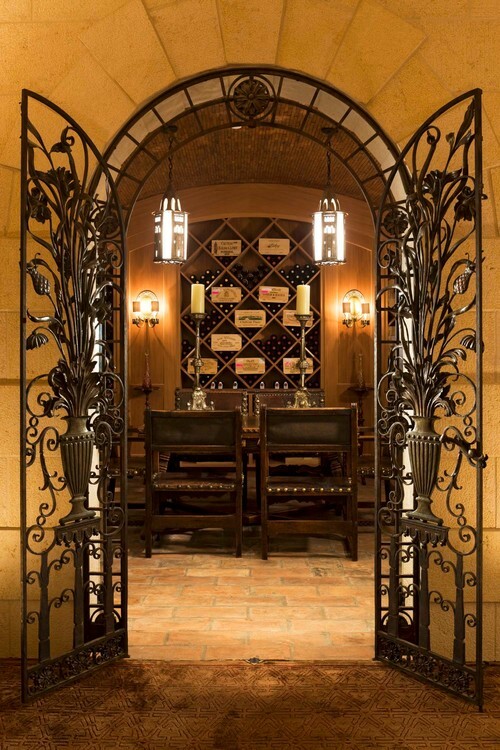 Besides on front doors and windows, wrought iron can also be an excellent material for gates and outdoor furniture. However, you might need extra protection like antirust varnish to keep those items from rusting. Front iron doors are not outdated. 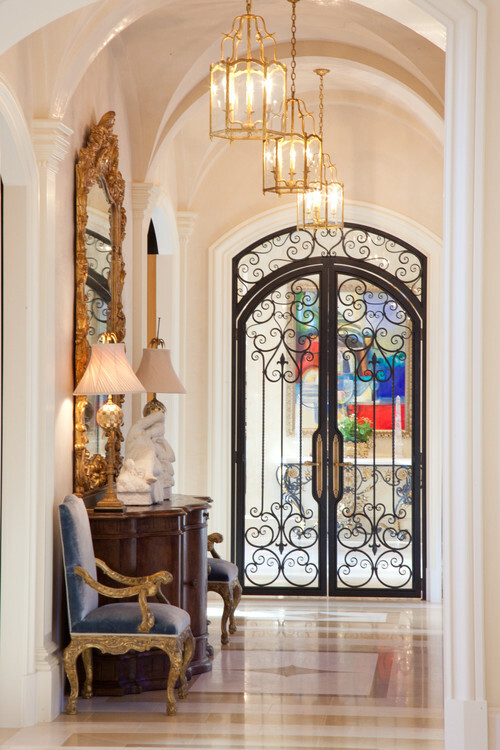 The flexibility and the possibility of turning the iron door into unique designs would give a sense of personality to your house. Please note that this iron door would likely to be heavy, so you would want to add an extra safety feature if you have children around the house. So, are you ready to give a new look to your house? Choose the design and consult the nearest wrought iron craftsman around you! 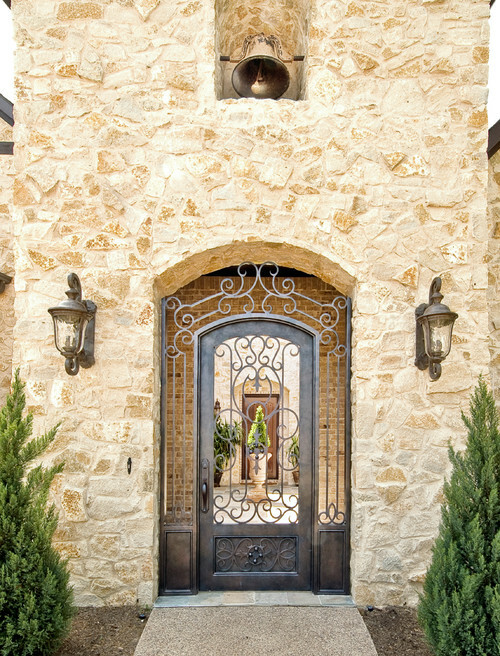 Photo by Patricia Gorman Associates, Inc.
Classy stone exterior residence image in Dallas. 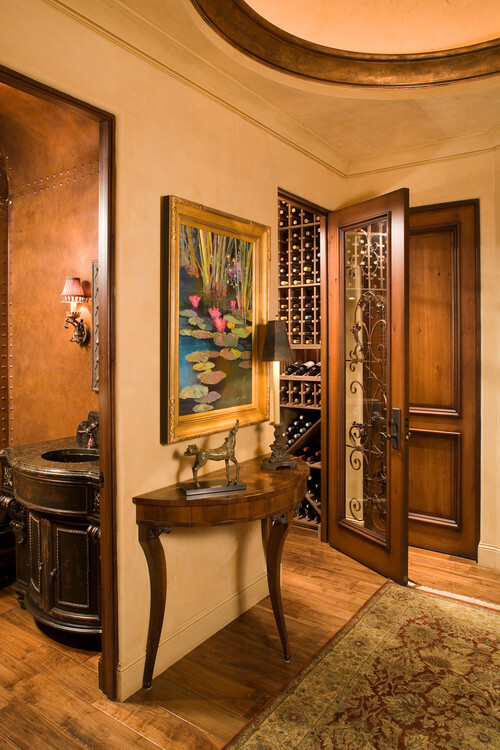 Tuscan dining room design in Orange County with white wall surfaces Wine cabinet developed into a cubbyhole. 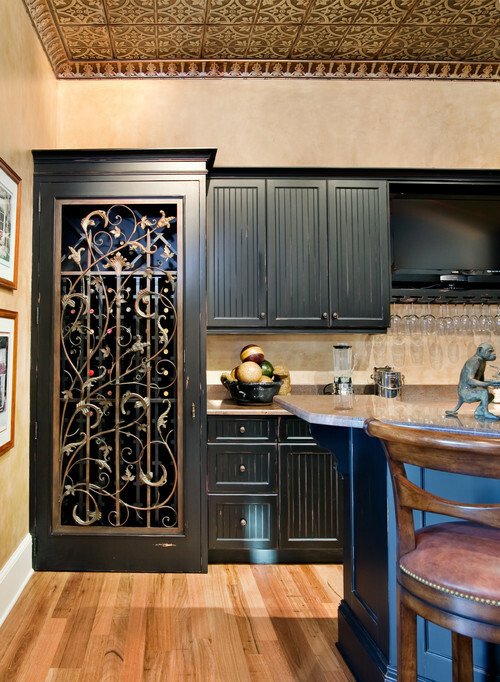 Personalized developed bar including an integrated wrought iron door. Classy entryway picture in Dallas with a black front door. Base panels with different equipment. Motivation for a mediterranean single front door remodel in Orange Area with a metal front door. I Love the iron around the door structure. A TV stand in the living room can be a great focal point as well to function as storages and displays. You may need to have several modern TV stand ideas especially if you want to have a complete entertainment center in your house. Pouring the idea into reality may not be as easy if you have limited space. There are tips and tricks that you can do to make it come true. Spacing, colors, and lighting need to be planned so that the area does not only appealing but also functioning well. The floor-to-wall cabinet is a good idea especially if you have many electronics to store. The storage area can be divided into 2 parts, the upper and lower part. The TV and other electronic appliances are displayed on the lower part of the cabinet. While the upper cabinet or shelves may be used to store your Blu-ray collections and other things that are rarely used, if you have children around, make sure that smaller things go on top so that it is out of their reach. With the right arrangement, the floor-to-wall would help you in organizing a limited space. Open shelving for a modern TV stand for the living room would not only make the room feels spacious, but you can also arrange the items along with proper decorations. This type of shelving is also suitable for those who prefer simplicity in designs. One thing to remember is that the open shelves tend to be dusty over time. Make sure that you keep an eye on its cleanness to maintain the look of your living room’s entertainment center. Not only electronic appliances, but you can also display some books on the shelves—creating a diverse aspect of digital technology with the look of papers surely will give your living room a dynamic look. Sharp and sleek lines are the key to modern TV stand ideas. Geometric style sometimes features diagonal or crossing lines. Most of this type of cabinet is also built with no handles so that the surfaces are clean from any accessories. With the modern geometric cabinets, you can play with just any materials—wood, glass, metal; you name it. To make it look tidier, hide all the cables by using cable trays or boxes. Good cable management will determine the look of your modern TV stand décor. A floating TV stand is also another item to make your living room looks modern. Some people also choose this kind of cabinet because it is safer for kids. Though it tends to save the space, the floating TV cabinet also stores less than the normal TV stand. If you don’t have too many devices on hand, the floating TV stand can be a perfect choice. To keep the area in one theme, you may also mount the TV above the cabinet. With the right choice of color, your living room will look great with this type of TV stand. Who else thinks that rustic is the new modern? Though the style has been around for a while, the right design of rustic furniture still looks chic and modern. You can use the classical cabinet with a natural wood color as a TV stand. To add a sense of modernity, choose a cabinet with fewer drawers and open shelves. If possible, arrange the devices according to their color and sizes. Also, it is important to choose a cabinet that is wider than your TV to keep the visual balance. Mounting the TV to the wall would create a modern look for your living room. Even when you have a wall-mounted TV, the TV stand should also be employed to add safety and for the sake of the appearance. Adjust the things that you want to display with the size of the cabinets and shelves. Some people want to minimize the storage area without knowing that they have too many electronics to handle. Thorough planning of buying the right size of TV stand should solve this problem. Avoid looking dull and boring by adding some décor around the wall behind the TV stand or on the shelves you have. Arranging flower pots, succulents, pictures, and paintings can be beautiful additions to your entertainment corner. Bellow is a collection of contemporary TV stand design ideas for your house. You might have crossed a house with a red front door before. Philosophically, red color reflects courage, vibrancy, power, and, determination. Throughout some traditions, a red door is not only made for decorative purposes, but it also tells a special meaning. If you are thinking to redecorate your front door by painting it, there are good reasons why red can be the best choice for it. Before you decide, here are some of the meanings of the red front door from a different perspective. Homeowners in Scotland paint their front door red to show that they have paid off their house mortgage. In its origin, this tradition is well known, and neighbors would congratulate the deliberated homeowner. In Chinese tradition, red has a welcoming impression. This is also the reason why you see so many doormats with the color red. Red is also the color of happiness, wealth, and fortune. Putting the color on your front door means that you are welcoming all those positive energies to the house. Early time in the United States, a house with a red door means that the homeowner was opened to welcome tired out travelers to take shelter. At that time, the signal was so important to recognize because the travelers didn’t have to guess which house was available and which ones were not. In the Bible, a red door symbolizes devotion and obedience to God. It would indicate that the members of the house live their life in the name of God. In the past, it is also believed that a red door protects the family from bad luck. During the Underground Railroad tragedy in the 19th century, where the African slaves were trying to escape to the North, houses with red doors signal that the homeowner is part of the movement and would provide meals and haven for the refugees. What If You Are Not Part of The Traditions? Don’t worry, painting your front door with a red color doesn’t mean that you should be part of those traditions. A front door does make a statement for the whole appearance of the house. It might also reflect the energy of the homeowners. Besides all those traditions, a red door is simply bright and inviting. If you are the kind of person who likes the attention, a red front door color might suit you. Furthermore, the red color looks amazing on any surfaces including wood, fiber, and steel. Surprisingly, a red door can go with most of the colors. For example, if you want your house to pop out, an all-white house with a front door would be iconic. Another example, a red door on a dark blue house would create a warm look especially if you have a set of beautiful gardens around the house. Furthermore, a red front door for homes can also be combined with other materials like glass, wrought iron, and stained glass. In holidays like Christmas, a red door would match perfectly with any festive wreaths. This is the most durable type of paint finish. It works best for doors and areas that are often to be touched. It is also a good choice for a front door because it is easy to clean. However, it is not recommended to use this finish for doors that are located on the house interior. It shines too much, and it would take down the focal points you have inside the house. Semi-Gloss paint finish has relatively high durability. Some of the areas that can use this finish type are the kitchen wall, ceiling, and front doors. If you want to have a paint that is durable but not too stand out, this finish is the right choice. Satin finish looks best on the house’s interior. However, the sheerness of the paint makes it easy to see whether the paint is applied by brush or roller. To avoid that, you may want to apply the paint by spraying it or create textures instead. Even though it is rather sheer than the semi-gloss finish, it can still be used as an exterior paint especially on red front door paint. This is the best types to choose if you want to give a bright color with fewer lusters. Lower than those three types of paint finishes, there are eggshell and flat finishes that are not usually used for front doors. They are more suitable for interiors as well as to create a warm feeling for the house. So, are you ready to change the face of your house by making a red front door? Whatever the reason behind it, a red door on the neighborhood will surely make your house easy to find—the same reason why Albert Einstein painted his front door red. Have extra space to create a home theater set? Try interesting home theater ideas to give the room personality. The year 2019 sees the rise of creative interior designs for home theaters. You can build an elegant, quirky, or pop culture-inspired room to enjoy favorite movies. Here are 13 ideas you can try to create memorable home theater space. Vintage home theater idea brings retro charm to a modern home. You can use beige walls, dark brown wooden panels, and light brown floor with red carpet to create this look. Create a double door with the leather panel as the entry, next to a dark wooden snack cabinet. To create a retro cinema look, install a curved panel with the personalized name above the door. Add a row of small bulbs along the panel top. Red seats and heavy curtains add the vintage charm inside. Trendy black home theater is perfect for adult homeowners. The room can consist of dark walls, grey floor, and black leather seats (with wide armrests). For more elegant design, add grey ottomans with faux fur sheets on top. Place pedestal tables between two seats. Home theater ideas don’t need to be formal-looking. You can use a bunch of movie posters into murals. Classic or award-winning movie poster murals look great on white walls. Thick carpet and blue sofas make the room more relaxing and charming. Large L sofa is perfect for more intimate home theater. Leather brown L sofa with patterned pillows create perfect seating arrangement. The screen should be installed on the opposite of the sharp sofa angle. It provides the best viewing positions for everyone. White ceiling and walls are perfect companions for the brown sofa. Use medium-brown wooden floor and darker carpet to complement the room. You can add additional seat row on the back to accommodate more people. Home theater with bar combines entertainment with dining spots. The easy setup is arranging rows or semi-circular seats in front of the screen, and the bar table is installed behind the seats (slightly raised). Connect home theater with the outdoor scene by installing large glass windows. You can enjoy music and good books with the curtains drawn. To enjoy movies, simply close the windows with dark, heavy draperies. Fantasy fictions are popular home theater ideas. You can include the themes using color schemes, patterns, materials, or decorations. For example, include the colors of Hogwarts houses in the room, or add dragon murals in the style of The Hobbit book arts. Wooden home theater creates a “Zen” feel. Use the same light shade for wooden floor, walls, and ceiling. Install modern minimalist swivel seats with warm colors to balance the wood, such as red or orange. 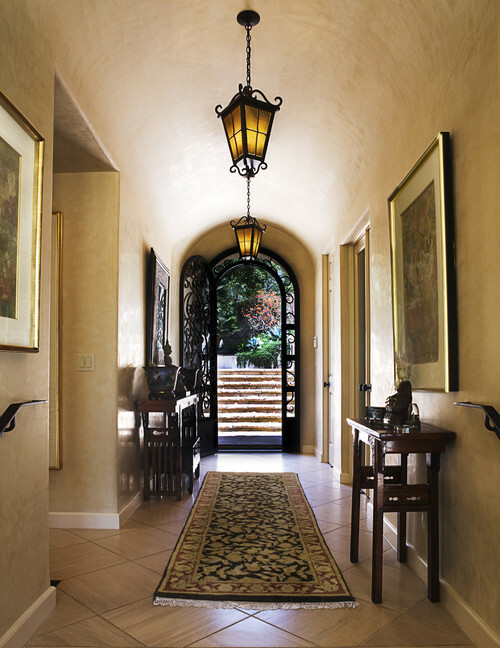 Lantern-style wall lamps improve the atmosphere. There are many ways you can create an artsy home theater. You can use a gallery-style design, with white walls, light wooden floor, and individual sofas placed on scattered spots. Place a small wooden table beside each sofa for classier snacks/drink space. For something more casual, try “film club room” home theater. The seats consist of secondhand sofas or long chairs with recycled wooden tables. Pad the wooden floor with patterned carpets of your choice. Print large-scale classic movie posters for the walls. For families with children, kid-friendly home theater is a good idea. The floor should be padded with carpet, not only for the safety but also the soundproof acoustic. The seats can combine two bright colors, such as orange and green. Use bean bags as addition to sofas. A futuristic home theater may showcase lots of gray color and sleek design elements. Instead of regular bulbs, you can use recessed light strips on the walls. Use dark grey for the ceiling, walls, and seats, but lighter shade for the floor. Install a darker grey color behind the screen to emphasize the images. Pair dark grey block sofas with white frame tables. Install the speakers and other appliances in hidden structures under the screen. Join the concrete trend by creating concrete floor home theater. The washed grey color will look rustic but elegant. Pair it with black brick walls and dark grey sofa. Add red ottoman seat for a burst of color. White home theater is a classic, elegant option for a modern home. Use white walls, ceiling, and seats to adorn the space. White carpets with minimalistic black patterns add dimension in the room. Use the white sound system to balance the black screen. Creative home theater ideas will give your house extra design perks. Enjoy your favorite movies or music in a room with a special design that matches your personality. This is our Residence Theater layout gallery where you could surf great deals of pictures. We hope you discover your ideas below. We add brand-new layouts weekly. While regular shaped windows protect you from the outside, the floor to ceiling windows provides a major unobstructed, crystal-clear panoramic view to enjoy the beauty outside. If you’ve happened to live near the seashore, by the lake, or surrounded by the green lush, it’s one of the best ways to enjoy nature where the majestic view lays before your eyes every morning. Meaning, this particular design can also act as your wall, your door, even your room’s partition. Floor to ceiling windows in full mirror coverage is frameless, so you have to get it planned during the house construction, mounted to the floor and ceiling; and replacing them is hard work. Despite a careful plan, this glass offers an infinite view across the room or natural sight up front. In modern houses, the windows are installed near a room which provides a beautiful garden view, inviting swimming pool, or where natural lights are required the most. Mind you that it must be installed at the precise measurement and pressure. Full mirror coverage of floor to ceiling window cost about $700 to $1,600 per foot. The arched design of the window is quite interesting in modern houses that serves both a clear view and decorative aesthetic purpose. Its visual resembles the dome-like windows, and more often than not, comes with steel frames. The dome-like floor to ceiling windows is perfect for houses with small spaces. If you wish to make a room appears larger, thank the geometric frame among the things to be considered before buying is the frame and glazing aspects. Be sure to choose a well-insulated glass and if you wish to save the planet, choose one with the energy-effective system. The mid-grade glass costs about $450 or lower. Though it has similar arched design as the dome windows, this one creates more dramatic, more majestic, and the maximum impact of a room. The cathedral-like windows are perfect for you who adore the Victorian design and fuse it with the contemporary look. The model is suitable for a house with high ceilings and makes a room appears taller. However, be sure to not make it over dramatic by placing plump decorative pieces and the less angular furniture to balance the look. Buying the pre-made panel floor to ceiling windows can help you save some bucks compared to the custom model. A piece that is well-insulated can help the maintenance factor in the future. If you’re lucky to find, some of the cathedral-like floor to ceiling windows for sale are under $5,000. This is probably the most common style in the floor to ceiling window design, in which frames protect the sides of the glass. No panels are attached to eliminate any view’s obstruction, offering a stretched vision up front. The full-length windows offer great freshness and spaciousness. Particularly with the insulated frames, you’ll get to have better insulation values and abe to reduce energy and eliminate heating cost. Single-frame floor to ceiling windows is suitable to be installed on the room facing the outside directly. The truth about having multiple panel windows is you also promoting energy and cost-efficiency. The multiple panel windows can come in many different designs, from squares, tinted at the top or bottom, or even the sides. In modern houses, the multiple squares and tinted windows are more common. Despite helping you save the environment, windows with multiple panels also create a better aesthetic point of view. The design can stand out, and if you opt for the tinted design, it helps you to avoid the glares from the people outside. Another great way of making your modern-looking house or apartment appears more modern is by installing windows with narrow frames. The floor to ceiling windows apartment with multiple narrow frames offers great air circulation while maintaining your privacy. This type of design makes a standout statement, and the narrower your windows, the more interesting they look. The windows can open inward, outward, or both sides, but both sides are more versatile and allow better traffic. While most modern houses incorporate steel or PVC frame construction, it’s never hurt to include wood as your floor to the ceiling window frame. It is produced in less resource extraction, less energy, and transport-efficient. The wooden frames also reduce the greenhouse gas emission by 26% to 31% compared to what steel frames can do. While some people argue that wooden frames are less durable, it has long lifespan under the well-maintained environment, coating the surface with pest-free and moisture-free materials. When some people install floor to ceiling windows to see the outside clearer, an obscured glass floor to ceiling window will conceal you from the outside. In most cases, this type of window is installed in the bathroom, a bedroom, or where privacy matters most. Without compromising the function, the window still makes a great statement of room decoration. The obscured glass also comes in many different designs from the mosaic, geometric, both monochromatic or in colors. There you have the 8 floors to ceiling windows design ideas for your modern house that is highly functional and beautifully decorative. Do you already have one in mind?